A siren/hooter plays a vital role where the factory much concerned about the timing, and warning. This siren forces a system for the proficient and disciplined work environment. A siren/hooter is a loud whistle device which fixed in a central location for the purpose to deliver the alarms, time-in and time-out processes for a big factory, schools, and some other work domains. Everyone needs an innovation for smooth access to technology and wants to make his/her life comfortable. Similarly, hooter operation is a time-consuming procedure as it required a person to operate the siren in the given period of time whether the process would be 2 times in a day or 10 times in a day. Every time a person needs to be there to organize alarms on a daily basis. Thus, it becomes a time-consuming process. So, the hooter system needs to automate so that no man-power can use for such alarm-based activity. You just need to configure your system as per your requirement and other related activity will be done accordingly. With great future vision, Star Link India provide company/factory a ‘hooter interface’ that can be used to automate the hooter/siren system. A hooter interface makes a connection between ‘hooter’ and the ‘biometric machine’. This biometric machine generates the signal as per configuration set in the machine. This hooter interface has a single phase 10A output that drives hooter to turn on and off. It can configure up to 25-time settings in a day(24 Hour). 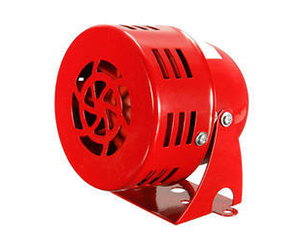 In addition, the duration of a siren/hooter can be set between 1 to 99 seconds as per requirement. The hooter system works in three stages, so the customer needs to add a connector for better connectivity. If hooter work on 3 phase then contactor can be connected to “hooter interface”. 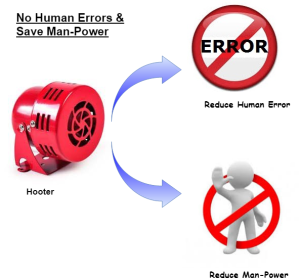 The primary advantage of this interface is to automate your hooter system as per requirement and reduce the manpower and avoid human errors. You can configure hooter/siren timing as per your requirement.